Staring blankly at your screen? Chances are you’re either sickeningly youthful or lacking in Czech connections. This Jabberwocky-style stanza isn’t from a book, nor an obscure fantasy film. In fact, followed by an effervescent electronic intro, it’s the opening to a dance track that, depending on your country of origin, you might think of as either criminally underrated or an instantly recognisable national institution. UK dance act Wubble-U, comprising Justin Bailey, Laurant Webb, Dave Pine and Dave Coker, released “Petal” in 1994. The word-twisting monologue was read by Stanley Unwin, an English comedian famed for his style of playfully mangled gobbledegook which he titled “Unwinese”. 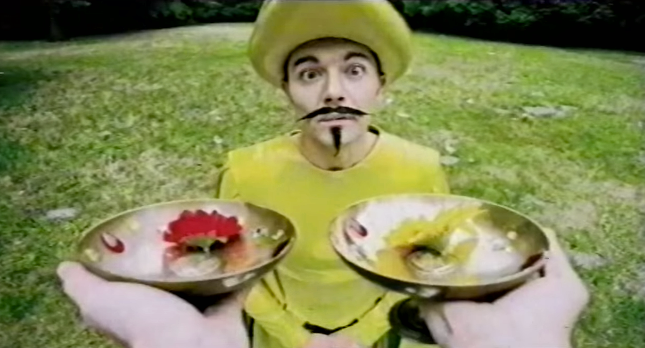 The accompanying music video (find a better quality but sadly abridged version here), littered with sunflowers, spacehoppers and day-glo hair, is a magnificent piece of 90s psychedelia introduced by Unwin himself in a dapper suit. But for all the contemporary trappings, it’s the song itself that really stands out. Arguably quite simple, the song pairs the hard with the soft: a rather tough, typically rubbery 90s house kick drum is swathed in bubbly layers of excitement, then that irresistibly bright and ringing refrain climbs and bounces us through the whole intricate yet uncluttered journey, with a generous scattering of blithe vocals from Unwin and singer Charlie One. The whole confection is irresistibly sunny and morning-bright, and despite the bug-eyed serotonin-soaked tone somehow conveys rave at its most sweet and wholesome. For all its distinctly British whimsy, the song found its true home further east after a 1998 rerelease – though it charted well in Britain and across the continent, the track truly dominated the Czech airwaves in particular throughout the late 90s. Knowing the track’s instant recognisability and mood-lifting power, we licensed it for Frisco’s cheeky spot in the Czech Republic late last year. It was great to put a slice of 90s dance greatness back on TV!